The biomass industry is heaving a sigh of relief for now, since the 2011 Omnibus Appropriations Act will not be voted on in its current form. The bill contained language that would have stripped funding for the Biomass Crop Assistance Program. While the biomass industry is scrambling to prevent Congress from slashing Biomass Crop Assistance Program funds in the proposed omnibus spending bill, USDA has issued new information about the program, following the Oct. 27 final rule release. The keynote speaker for the Pacific West Biomass Conference & Trade Show has been supporting biomass utilization since he stepped into his office at the Washington State Department of Natural Resources, launching the Forest Biomass Initiative. The Pellet Fuels Institute is just months from implementation of its new pellet fuel standards, including for the first time third-party verification for compliance. Participation in the program comes with a new label for bags of pellet fuel. 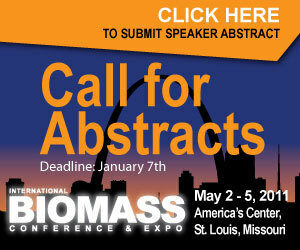 Leaders in the biomass industry are urging others to contact state legislators to bring to their attention the dramatic repercussions a section of the near 2,000-page, $1.1 trillion 2011 Omnibus Appropriations Act would have on the industry. Forsite Development has finalized crucial decisions in the process of developing its 20-megawatt waste-to-energy plant along the Catawba River in Charlotte, N.C., just one part of a plan to transform a Superfund site into an eco-industrial area. Besides the Seattle Steam combined-heat-and-power plant (CHP) and Qualco Energy's anaerobic digestion facility, the Pacific West Biomass Conference & Trade Show tour will also feature a CHP plant operated by Kimberly Clark in Everett, Wash. In an effort to generate jobs, build a market for fire hazard reduction materials and assist businesses to become energy independent, Wisconsin has announced a grant for companies to convert old fossil-fueled boilers into woody biomass boilers.